What is the Big Battery Hunt? 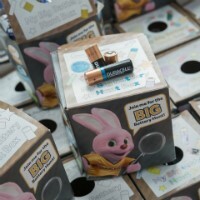 The Big Battery Hunt is a back for year 2! 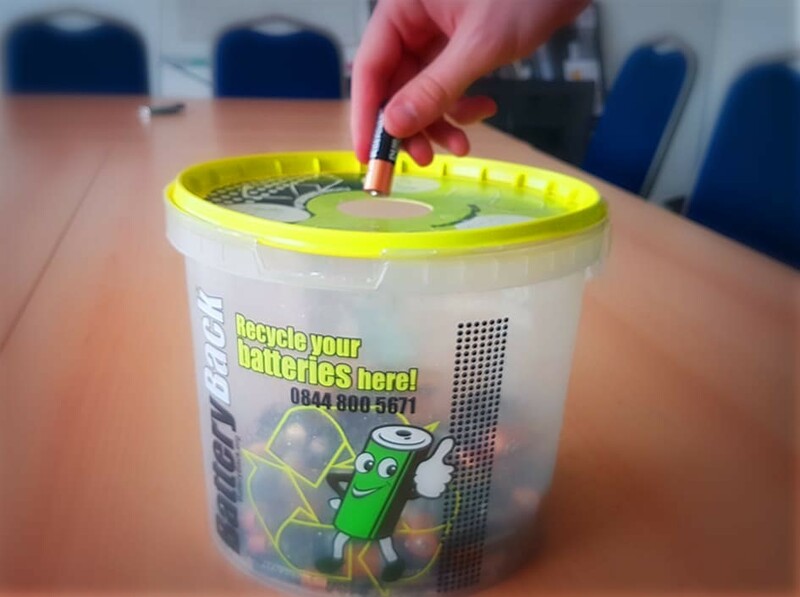 Last year we managed to recycle 4 million batteries as part of our nationwide battery recycling initiative funded by Duracell. Young people in schools across the UK are encouraged to think about the importance of recycling, and then challenged to collect as many used batteries as they can. The aim is for each pupil to contribute to an overall total and help us beat last years total! Who is the Big Battery Hunt open to? The initiative is currently aimed at Primary aged children and has a pupil activity booklet for Key Stage 2 pupils. But everyone in the UK can take part. Each registered school will receive a collection box for each pupil and access to the resources. My school is not on Mainland UK. Can I still take part? You will also ALL be able to enter your students into the battery pioneer competition by letting us know over email and social media how well your pupils are doing, they will be eligible to win prizes like iPads! How do I take part in the Big Battery Hunt? Each UK registered school will receive a free collection box for each pupil, a school container and free collection service, and access to the online resources and competition. What are the pupil collection boxes? When will my pupil collection boxes arrive? Boxes will take around 4 school weeks to arrive from the point of registration, but we do not deliver during school holiday’s so this could add time if you order close to the end of term. Please note your pupil collection boxes will arrive separately from the containers. I have received my pupil boxes, but I need more. Can I order extras? What do I do with the pupil boxes when we have finished with them? The collection boxes are made from 60% recycled material and they can be recycled again. Pop them into your cardboard recycling once you have collected all your batteries. What are the school containers? 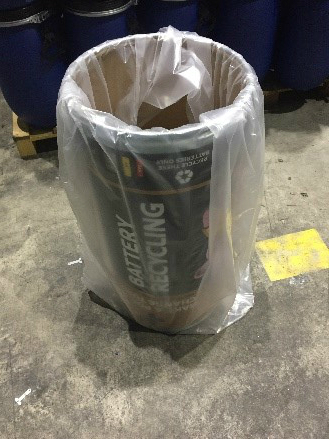 Each participating school can request a recycling container for all their collected batteries. 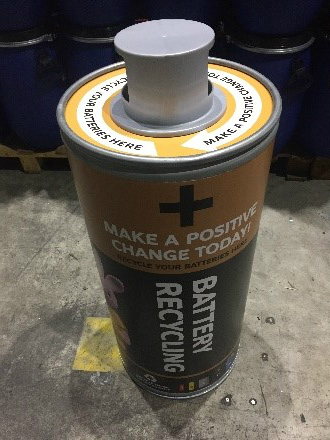 Please note if you took part last year in the Big Battery Hunt and received a container, you will not receive a second one. There are two types of containers. 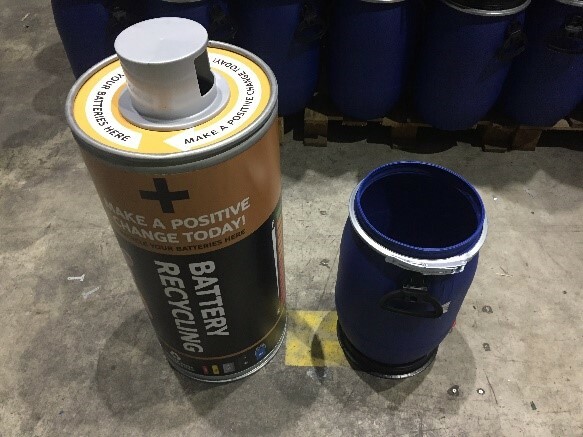 You will only receive one type, the first 2000 schools to register with more than 100 participating pupils will receive the slightly larger battery shaped containers, otherwise you will receive five of the smaller table top containers. When will my container arrive? The containers can take 4-8 weeks to arrive excluding school holidays. Please note these will arrive separately to the pupil collection boxes. How do I get my batteries collected once the school container is full? 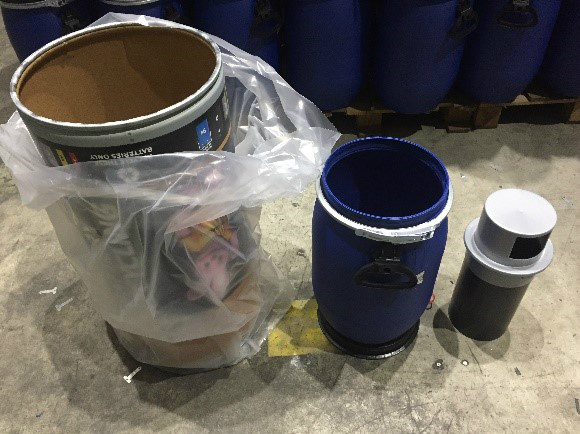 Once your containers are full you just need to call the number on the side (0844 8005671) or email BBHcollections@batteryback.org to arrange a free collection. Only your batteries will be collected, leaving you with the container to refill time and time again throughout the year. Can I keep collecting batteries using the school container after the Big Battery Hunt is finished? Yes! In fact, we really hope you do. Batteries take 100 years to decompose, so if you keep recycling them, it will go a long way to helping the planet. We will even keep collecting your batteries free of charge. How do I assemble my container? Your container will be delivered by a courier and it will take just a couple of minutes for you to assemble and start collecting batteries. Unclip steel band and remove the lid from the drum. Remove the top hat from the drum. Place the lid on the floor right way up. Put the steel closing band back onto the top of the drum and close lever to secure. Place the drum on top of the lid. Insert the top hat into the top of the sleeve so that the tabs pass through the cut outs. Rotate the lid through 180 degrees to secure the top hat. Place the sleeve over the drum which is already positioned on top of the lid. Your recycling container is now ready for batteries. Please take time to read the safety instructions on the back of the container. You can watch the video guide here. How do I enter the Big Battery Hunt Competition? To enter the competition, you just need to have 1 battery collection, a battery collection is when you have enough batteries to call for them to be collected, once you have done this you will be automatically entered into the competition. To request a battery collection, you will need to call 0844 8005671. 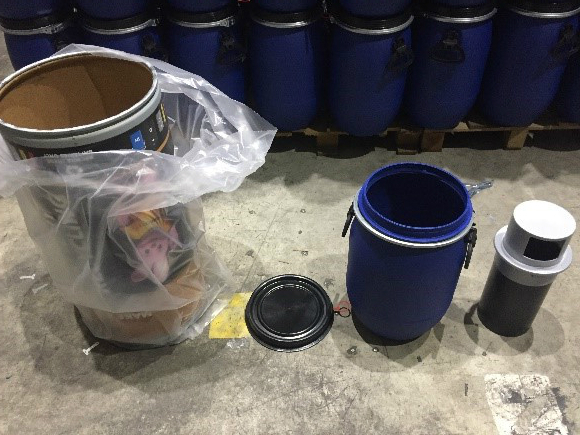 If you have the large battery shaped container this will need to be ½ full and if you have the smaller tubs you will need to fill 3/5 of them. The competition is due Monday 3rd June. What is a Battery Recycling Pioneer? 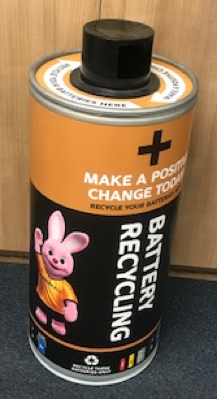 As part of the Big Battery Hunt we are looking for your best Battery Recycling Pioneers – these are pupils that really get behind the challenge and encourage others to do the same. If you have a pupil that has gone the extra mile with their battery collecting, then tell us their story and they could win some extra prizes. These Pioneers could win all sorts of prizes such as iPads! How to Enter your Pioneers? You can also tell us on social media but don’t forget to hashtag #BigBatteryHunt. We will be announcing these throughout the programme so make sure you keep us up to date! *This is open to everyone in the UK and Ireland! Are there free resources for the Big Battery Hunt? Yes! You can download all the resources from our website here: https://nationalschoolspartnership.com/initiatives/bigbatteryhunt/. But you need to be registered to the National Schools Partnership website and logged in first. The resources will then be listed down the right-hand side of the page. I can’t see the resources – where are they? Resources are only available to our registered teachers. You can register by clicking ‘Register Now’ on our website here https://nationalschoolspartnership.com/initiatives/bigbatteryhunt/ Once you are registered to the National Schools Partnership you will be asked 4 Big Battery Hunt subscription questions before you are part of the initiative. I’m already registered, and part of the initiative so why can’t I see the resources? All our registered teachers have access to the Big Battery Hunt resources, but you need to be logged in first and subscribed to the initiative. Make sure you are logged in by clicking ‘Log in’ found in the top right hand corner of this page: https://nationalschoolspartnership.com/initiatives/bigbatteryhunt/ You will then be able to see the resources on the right hand side. If you still can’t see the resources, this means you have unsubscribed from the Big Battery Hunt initiative. Make sure you are logged in and then click the register now button to answer the 3 Battery Hunt related questions again. You will not be sent a second set of boxes, this will just replace the data we already have. You should now be able to see the resources.